Keep DIY dapper with this handy punch, designed to make your own collar stays out of old credit cards. Keeping your shirt looking sharp is a must when you're off to the office, a formal event, or a date, but when they're not lost deep in your drawer, collar stays are a huge hassle to keep on hand. Don't flip out--clip out your own with this handy punch! 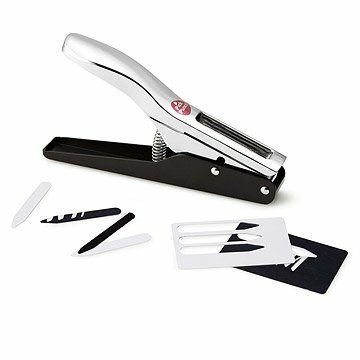 Simply sandwich an old credit card, license, or used gift certificate in the press and squeeze to create a new set of collar stays in a snap. Environmentally friendly and oh-so smart, this tool is sure to save many an outfit from falling out of line. Made in China. Creates 2.5" l x .2" w collar stays. My son who travels for work & accumulates room keys but loses collar stays LOVED this! This was a wonderful solution to missing and lost collar stays. We have a neverending supply of old gift cards and membership cards that can be put to good use. One caveat: don't use laminated or old layered cards. These may not cut smoothly. Regular cards like credit cards cut fine, but may require smoothing out if not enough pressure is applied in punching. These collar stays fit standard size collars. This collar stay punch is the BOMB!! My husband always loses collar stays but always seems to come home with the key card from his hotel stays while on weekly business trips. This collar stay punch is GENIUS! What a neat, neat gift it was for his birthday! Infinite collar stays. They come out perfectly! Awesome item for the traveler! As a frequent traveler always buying stays & forgetting to remove them before having shirts cleaned- I recycle hotel room keys into something I would otherwise buy. Great invention! My Don loved his punch! Awesome idea mom! Love it! I bought this for my husband for Valentine's Day. Being a guy and a gadget freak he thought it was the coolest thing. With a husband and two sons we go through collar stays like crazy. The guys had a great time finding old motel cards, credit cards, and even hard packaging to cut stays out of. The only thing you have to watch for is the stays really FLY out of the machine when you cut them. Fits well in various collar sizes! If you have old credit cards, gift cards, etc. lying around, your good to go! Really a great gift. The recipient loved it!